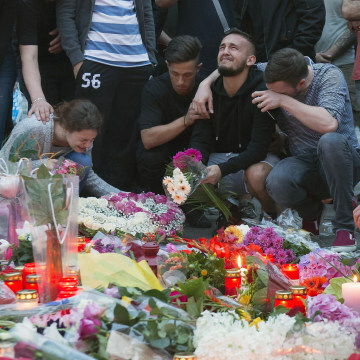 Witnesses to a shooting spree at a Munich, Germany, that killed nine people recalled harrowing scenes of terror and panic Saturday as a memorial grew outside the shopping center that was the scene of a shocking act of violence just the day before. Huseyin Bayri, 29, who was at the Olympia Einkaufszentrum when an 18-year-old gunman opened fire Friday evening, told reporters that he held a teenager who was shot and comforted him as the victim succumbed to his wounds. All the while, Bayri was thinking he would be next as the shooter came closer. “I saw the boy beside me — I didn’t know him but I took him straight to my heart — had fallen down,” Bayri said. The boy was shot three times, he said. “I tried to keep his wounds shut while the attacker was still shooting. The shots were getting closer. And I thought to myself: ‘This is it. Now you’re next, Huseyin,'” Bayri said. Bayri said he tried to comfort the boy, asking him his name, where he lived, and whether he had a girlfriend. “‘Your injuries aren’t that bad, brother,’ I said to him. ‘The ambulance is already on its way. Don’t worry, everything will work out.’ Then he died in my arms,” Bayri said. Bayri said he heard the shooter yell “I will kill you all” and “I am German” before the first shots rang out. The gunman fatally shot himself in the head after police made contact with him, authorities said. The rampage paralyzed Munich, and authorities shut down all mass transit and some highways as police conducted a manhunt for what was initially to believed to be multiple gunmen. Police later said the shooter acted alone. 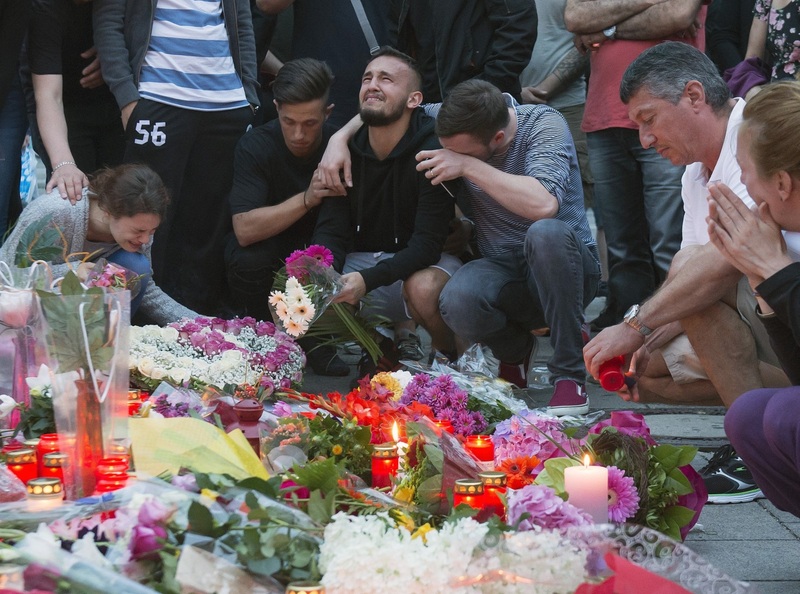 Searches revealed that the 18-year-old shooter, who was described as a German-Iranian born and raised in the Bavarian capital, had “looked intensively” at the subject of “shooting rampages,” Police Chief Hubertus Andrae told reporters Saturday. “There is no indication that there is a link to ISIS,” Andrae said. Germany’s top security official Interior Minister Thomas de Maiziere said other information showed the shooter, whom he identified only as David, had researched a 2009 school shooting in Germany, and the bomb and gun attacks in Norway by Anders Behring Breivik, who killed 77 people exactly five years ago Friday. Andrae said seven of the victims were teenagers; a 20-year-old man and a 45-year-old woman were also killed. All were residents of Munich, he said. One of the those killed was a Greek citizen, that country’s foreign ministry said Saturday. Twenty-seven people were hospitalized, including four with gunshot wounds, Andrae said. Franco Augustini, who lives near the mall, said his daughter hid in the shopping center during the attack. German Chancellor Angela Merkel called a special meeting of her government’s security Cabinet, meeting Saturday with de Maziere, other ministers and the head of the country’s security agencies.